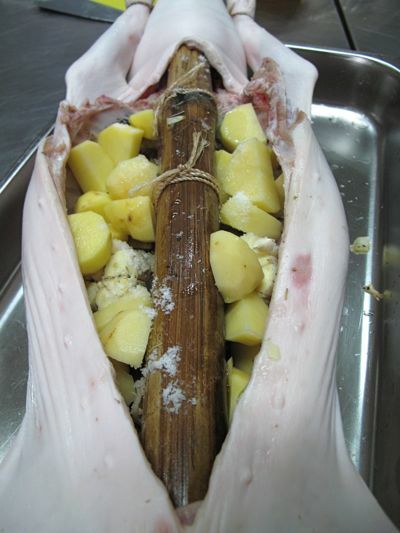 A roughly 3.5-4.0 kilo cleaned weight lechon de leche was prepared for seasoning. Into the cavity went some garlic, onions, salt, black pepper,thyme, rosemary, olive oil and roughly 4 teaspoons of black truffle puree. A friend brought back the pureed black truffles in a the small bottle a few months ago from a trip to Rome. Another friend sent the truffle salt over. And we had some truffle oil as well. So why not use as many forms of black truffle as we had on hand? :) We sprinkled some truffle salt inside the cavity. I remembered to put some peeled and cut up potatoes, hoping they would absorb all of the pig juices and truffle flavor inside the cavity. Before it was expertly stitched up by Arnold, our master lechonero. We didn’t give this piggy the “accupuncture” treatment because I was afraid it was too small and the skin too thin. We also didn’t add coconut water which would have helped to caramelize the skin a little more evenly. The skin was crisp and wafer thin. Hardly any fat whatsoever on this mini-beast, and the meant was amazingly succulent and tender. A last minute sprinkle of truffle salt meant there was a salty crunch to each bite, and the heat on the skin surface released the aroma of truffle bits in the salt. The potatoes were superb! A bit soggy, but soaked with flavor. Some would like more roasted color on their potatoes, but these ones worked well with the rich meat and skin. The cranberry sauce was a good accompaniment, but many of the crew seemed to find it a bit new or a little strange, my explanation that it was a bit like “their” version of acharra in the West. 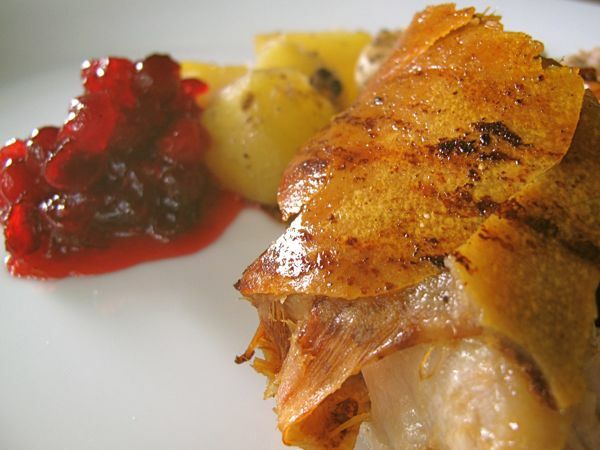 I liked the pairing of sweet/tart cranberry with lechon, but it wasn’t necessary really. Must remember not to read marketman’s blog when i’m on a diet.. Incredible! Hats off, Marketman. Seems like you are back in your element. And such great timing, too, as it is truffle season. wow!!!!! great comeback post MM. straight to the PORK! Wow, would love to try that. How I envy your crew! To eat experiments like these…. Priceless! I’m salivating. Can I apply as a crew member? Bourdain should try this! I can only imagine that this is better than the “best pig ever”! Amen. 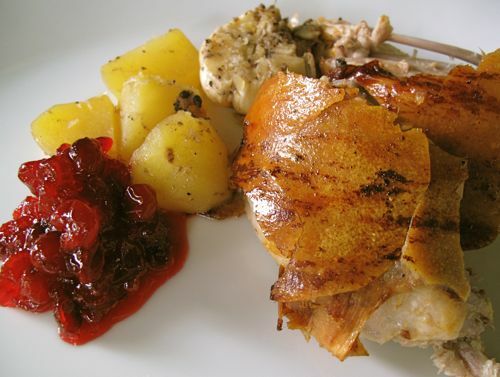 And that is how Thanksgiving in Cebu beat all other Thanksgivings elsewhere! White truffles are now in season and are available here for a mind boggling 300k per kilo, with a 50 gram minimum order. I bought some fresh black summer truffles last July at a more affordable 15k per kilo, but I have to say that it wasn’t as aromatic as I expected. For the price, the cheaper truffle oil had more punch even though there is no truffle in “truffle” oil. It’s just a chemical additive that simulates some of the taste and aroma of the true truffle. The truffled lechon sounds like pure genius, though I do hope the truffle flavor permeated through the meat. After reading your blog, my husband just grumbled behind my back saying…”paano ba natin makakaibigin yang si marketman?? ?” :) i hope i dream of roasted pigs and truffles tonight. I hope this is on the menu on your next EB, MM!!!!!!!!!!!!!! I was thinking maybe you can try it over htere ….on second thought maybe not….I think you need OAK trees. But then who knows maybe some kind of tree can be subbed for Oak trees over there. If you’ve ever been to Rome or anywhere in Italy in the Fall, you know it’s the height of truffle season. In posh hotels and restaurants, you’ll often come across displays of the largest harvested truffles and the air is redolent with the distinct aroma. Wild boar hunting season must also be at its peak, because that is a very common menu choice alongside all sorts of truffle-flavored dishes. It may be a bit ironic that a pig (the traditional truffle gatherer’s “sniffer”) gets stuffed with the very flavor that it loves so much. Of course, these days, they usually use trained dogs since they don’t like to eat the harvest like the pigs do. I wish I could have had a sampling of that lechon. Sounds heavenly. Truffles are one of my favorite treats — shaven, over al dente buttered pasta or over a simply baked potato with olive oil and sea salt. Does Zubuchon sell in Manila? grabe na to!! awesome although i imagine i’d feel heady from all the rich flavor afterward. Dear MM I’m so glad this experiment worked. I know you’re a master of serendipity but this is almost identical to a traditional Frennch dish cochon de lait perigourdin from the truffle rich Perigord region. It’s popular because you can use the less expensive truffle pieces or truffle peelings (fresh or preserved) rather than expensive whole truffles. 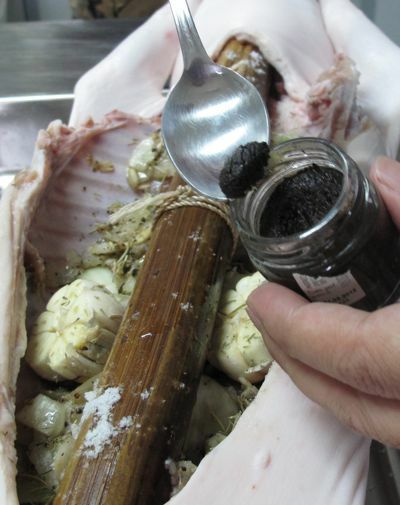 One variant includes sausage meat mixed with the truffles, garlic, herbs etc and bound with raw egg as the stuffing. It would be interesting to try this with an authentic longanisa – hubad of course and not too sweet. For those like us who don’t often have a suckling piglet on hand, another variant is called enchaud perigourdin which is a whole loin of (mature) pig with or without bone. 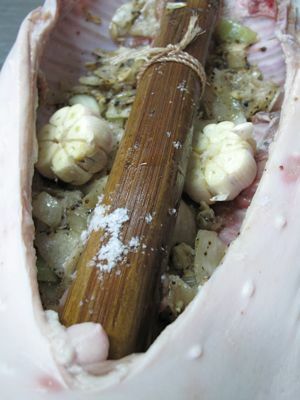 With the bone, you make a pocket between the ribs and the flesh and insert the stuffing, or the whole fillet can be stuffed and rolled. I prefer the bone-in version (with skin!) and while this won’t be as great as lechon, can be cooked in a domestic oven. By the way, the French never throw out the fat from this, well strained of solids it keeps in the fridge and is great for frying potatoes or indeed any vegetable – it would cheer up any humble ginisa! For the truffle-less, a version is also made using chestnuts. Also, cranberries being American, the French add a fruity touch with apples, grapes or prunes. Oh my mm! Wow! That first photo really made me drool. Oh gosh, This is making me hungry…… at 2am. Makatulog na nga! Yummmmo!! Can’t wait to try to replicate it when we go back on vac.to Phil. AYYYYYYYYYYYYYYYYYY SARAPPPPPPPPPPPPPPPP!!!! I can just imagine how good that lechon is 2 of my favorites Truffle and Lechon what a combo indeed!!! The most expensive lechon ever! Glad that it worked. Suwerte your family and crew! For breakfast this A.M. I’m having poached eggs sprinkled with truffle salt,yum! Josephine, those dishes SOUND AMAZING… I have never been to truffle country and would love to do a trip there during the height of truffle season. I have read elsewhere that pork and truffles were a good pair, hence the experiment. 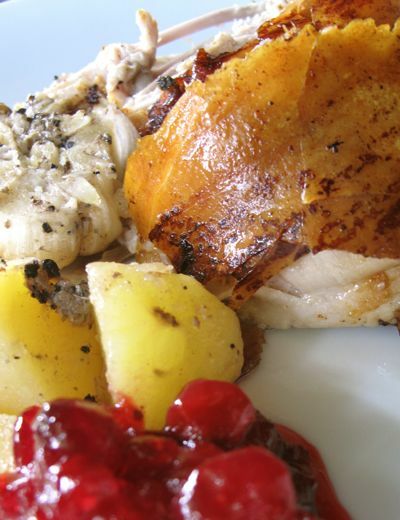 Having a roast suckling pig with truffles was a natural evolution… and a delicious one! Now I know what to look out for when in that part of the world… Oh, one question, is the sausage meat infused with truffles then stuffed into the suckling pig? Amazing. No, Zubuchon does not have this on their menu. EGR, Zubuchon has no outlet in Manila. But we ship lechons airfreight for pick up at the Manila Domestic airport. Another brilliant idea of MM!……I’m really looking forward to that cookbook! What a delightful twist on your Thanksgiving spread. I loved how the lechon was expertly stiched up — pretty cool. Loved everything else but have a feeling that the potatoes inside the lechon came out pretty soggy with all the absorbed pig fat/oil. MM Come to my place anytime. I was one of your lurkers till you threatened to leave us… I spend roughly half my year in Manila and half in France – I eat bagoong and manggang hilaw to get over the foie gras…. PS The sausage meat is optional – otherwise you make a kind of embutido like our old dear departed cook used to do in my childhood. Tachycardic, breathing fast too. This post just made me want lechon. I’m gonna die!!!!!! 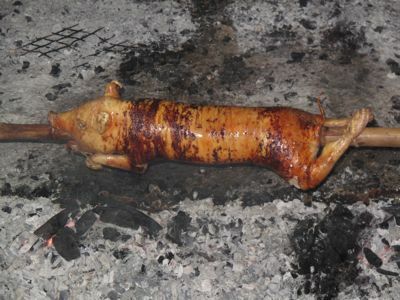 congrats for another successful lechon.. i love the way the pig is stiched. good job for your lechonero.. I rarely use this expression but I really need to now: OMFG! I am salivating. 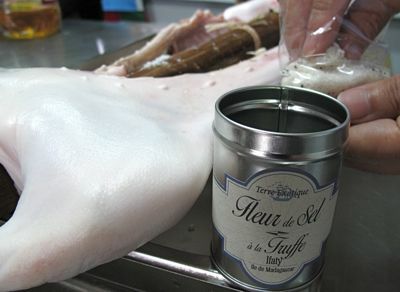 Truffles and animal fat is proven to be an excellent combination. Thank you very much for the information ms. Josephine from France as I might visit France next year. A less expensive substitute for pureed black truffles is salsa tartufata (tartufo sauce that contains 1% black truffles) costs P1k at Bacchus in Power Plant. I really need to get my hands on those pureed black truffles! oooooh. craving for some lechon now…. whats a good substitute for truffle salt? Thank you for taking it to the max! Looks so gooood indeed! Good Lord! Can I place an order for this for Xmas? ;p Such sheer torture to read this and not have a taste! The Italian white truffle is considered the queen of the kitchen, but the black truffle is considered the diamond. What many people dont know is that the black truffle is being farmed in Spain & many other countries of the world. Black truffle farms are a great way to make a living. OMG! nobody does this things and I think it’s just pure genius. lechon with truffles…lechon with aioli lol…the combinations are endless. would love to have this on my birthday!!! KALOKA ANG FIRST AND LAST PICTURES! 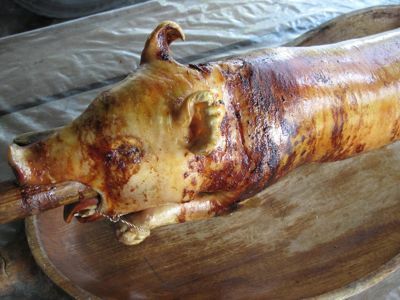 My gads.. what a decadent spin to lechon de leche… I am ABSOLUTELY drooling at this! good work, MM! W.O.W!!!! I second the motion! I hope this will be in the next EB! Just by the pictures alone, you already had me salivating for zubuchon… MM you should start a branch here in Manila ASAP! Mmm, definitely got a winner there! How often do you baste the lechon? And do you baste it throughout the cooking process? oh my, i envy Artisan Chocolatier and the crew for tasting… really yummy!!!!! I want, I want, I want. Oooooohh. @Mary Lee, actually, the truffle dogs eat truffles too. But they are easier to train than pigs. Marketman, this was a good year for white truffles. But even in Italy you have to be careful that you’re not buying truffles sneaked in from other regions. Truffles and eggs…mmm! why am i from the US, MM? Based on your verdict and the enticing pictures, this one has earned its place in your upcoming book. And one day when I can find an pig as small as the one you used in your experiment, I will duplicate your recipe. Finding the pig is the new challenge for me. The Pacman vs. Margarito fight is currently on but all I could think of is my chance to replicate your recipe tomorrow. I found the baby pig at Half Moon Bay this afternoon. And the Gourmet corner store in San Mateo sold me the black truffle oil and salt. He had no pureed black truffles. Instead he had black truffle peelings he suggested I puree. I hope my result will be close to yours. please let me know how can i order your zubuchon? My crew called me aling Mila the lechonera while we had a great time roasting our 20 pound piggy. I was the commander in chief while I guzzled down the bottle of Vacqueyras I purchased from the Gourmet corner. My only regret was that I gave in to my mother in law who insisted on stuffing piggy with too many potatoes. The lechon was still juicy and the skin much crispier than the first lechon we made last month. But I still wonder if the truffles were overpowered by the potatoes. Bottom line: lechon devoured in less than 2 hours. Hey marketman, been reading some of your posts here and there for a few years now and all i can say is: I WISH I COULD LIVE IN YOUR KITCHEN FOREVER AND EAT ALL THE YUMMY FOOD YOU COOK! but anyway…i guess ill just have to try cooking these recipes on my own. Thank you for being so generous (with your recipes)!